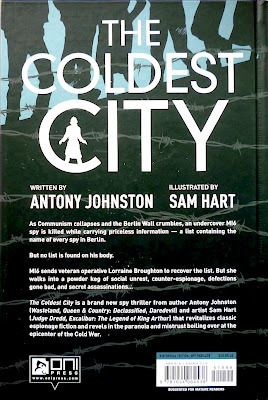 Published by Oni Press in May of this year, The Coldest City is British writer Antony Johnston and British expat artist Sam Hart's comics take on a John le Carré-style espionage novel. 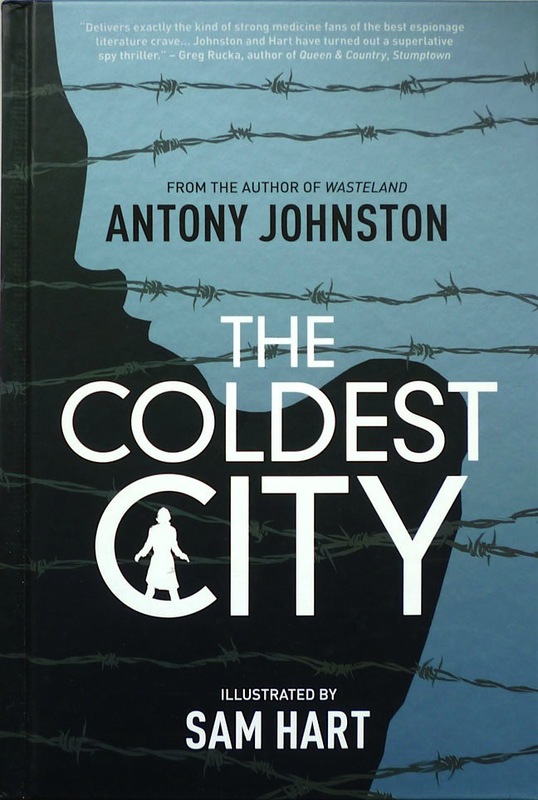 Set largely in Berlin just prior to the fall of the Berlin Wall in 1989, it follows MI6 operative Lorraine Broughton as she's sent to the city to recover a list of names of every agent at large in the area, which has been lost following the death of a British spy. Once there, she's met by head of station David Percevel, an agent of the old school who objects to a woman being sent to "his" city, and who proves as obstructive as he is helpful. Of course, nothing is as it seems, and Lorraine is soon caught up in a web of intrigue and violence, with hidden agendas and double-crosses aplenty. 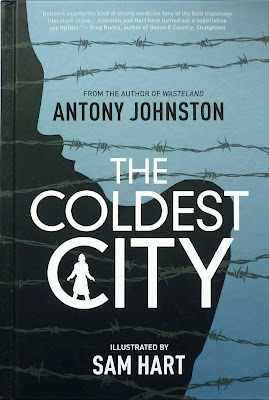 Johnston already had form with spy thrillers prior to The Coldest City: in 2005 he wrote a fine three issue miniseries spin-off from Greg Rucka's excellent Queen & Country comic (Queen & Country: Declassified), an experience which inspired him to pen more spy fiction. 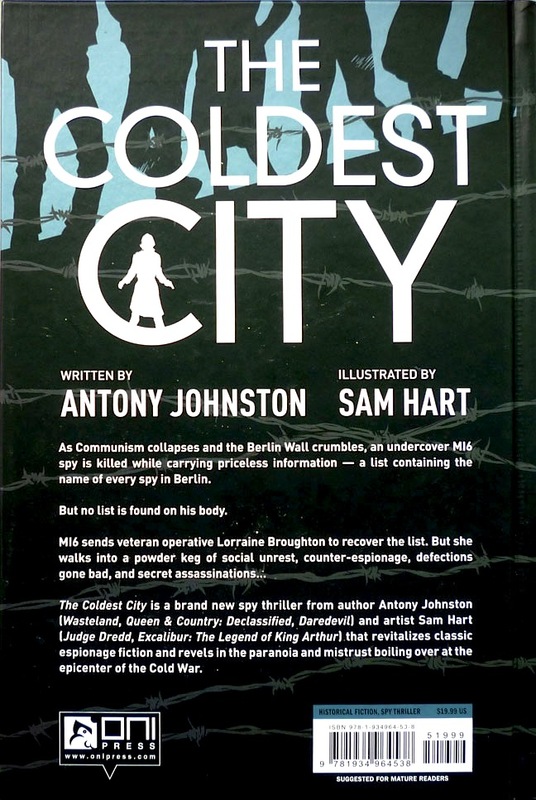 I believe I heard about The Coldest City via Double O Section, and given my passion for all things espionage, naturally I snapped a copy up from Dave's Comics in Brighton when it was published. But as I was paying for the graphic novel, the man behind the till mentioned that Antony would be signing copies at the shop that weekend, and if I left my copy, he'd sign my one. 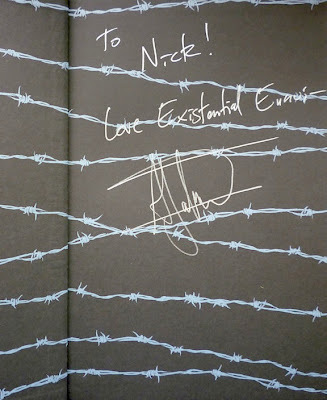 There we have it: the first book ever to be dedicated to Existential Ennui. 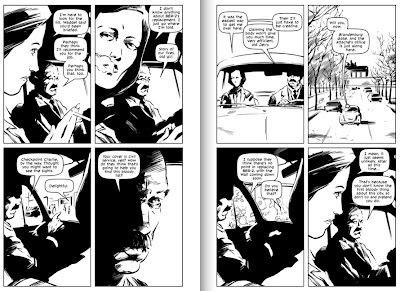 And I couldn't have asked for a more appropriate one either: it covers two areas of my interests – comics and spy fiction – and more importantly it's really rather good – low key, murkily evocative of the era, and with a nice twist in the tail. Cool! Antony's a thoroughly good egg! I hadn't heard about this but it looks great. Sam's artwork is vaguely reminiscent of early Steve Yeowell. That's a good point about Yeowell – I hadn't registered that, but you're right. Wonder if Steve was an influence?